The instant Alcohol Dip Test will detect alcohol in human urine in concentrations of 0.04% and higher. NEW ON THE MARKET TEST! This is an instant alcohol dip stick screening test. 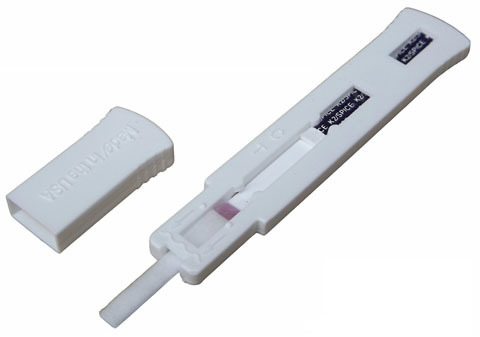 Urine Alcohol Test is intended for use as a rapid method to detect the presence of alcohol in urine greater than 0.04%. The test is intended for the detection of ethyl alcohol in human urine. To confirm the concentration of positive specimens, an alternate, non-enzymatic technology such as headspace gas chromatography should be used. Excess or inappropriate consumption of alcohol is a common and pervasive social problem. It is a contributory factor to many accidents, injuries and medical conditions. Screening of individuals for alcohol consumption is an important method for the identification of individuals who might be at risk due to alcohol use or intoxication. Screening is also an important deterrent against inappropriate alcohol consumption. The blood alcohol concentration at which a person becomes impaired is variable dependent on the individual. Parameters specific to the individual such as physical size, weight, activity level, eating habits and alcohol tolerance all affect the level of impairment. Determination of ethyl alcohol in urine, blood and saliva is commonly used for measuring legal impairment, alcohol poisoning, etc. Gas chromatography techniques and enzymatic methods are commercially available for the determination of ethyl alcohol in human fluids. Alcohol Test is designed to detect ethyl alcohol in urine. The distinct color on reactive pad could be observed in less than 60 seconds after the reaction pad was wetted with urine specimens with the ethyl alcohol concentration greater than 0.04%. It should be pointed out that other alcohols such as methyl, propanyl and allyl alcohol would develop the similar color on the reactive pad. However, tehse alcohols are not normall present in human urine. For Forensic and Research use only. Do not use the product beyond expiration date. Handle all specimens as potentially infectious. The product is sensitive to the presence of alcohol and moisture. After opening the package, the test device should be used immediately. Urine specimen can be collected in a collection cup or a clean container. Avoid contact with skin by wearing gloves and proper laboratory attire. Open the foil package and remove the test strip. Dipping the strip into the urine specimen collected in a collection cup. After wetting the reaction pad with urine speciment, immediately remove it. At 2 minutes, compare the reactive pad with the provided urine alcohol color chart. Results after more than 5 minutes may be inaccurate. Almost no color change by comparing with the background. The negative result indicates that the alcohol concentration is less than 0.04%. A distinct color developed all over the pad. The positive result indicates that the urine alcohol concentration is 0.04% or higher. The test should be considered invalid if only the edge of the reactive pad turned color that might be attributed to insufficient sampling. The subject should be re-tested. 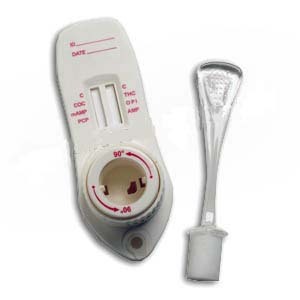 Alcohol Test is designed for use with human urine only. A positive result indicates only the presence of alcoho land does not indicate or measure intoxication. There is a possibility that technical or procedure error as well as other substances in certain foods and medicines may interfere with the test and cause false results. Please refer to "Interference" section for the list of substances that will interfere with the test results. Alcohol Test is a semi-quantitiative assay. It identifies alcohol in human urine specimens at a concentration of 0.04% or higher. These compounds are not normally present in sufficient amount in urine to interfere with the test.